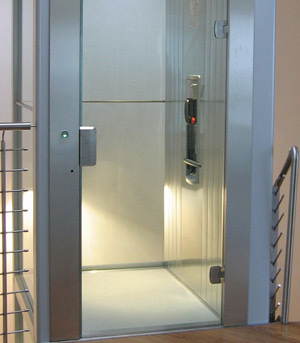 Gulliver is a hydraulic vertical platform lift that is suitable for a wide range of home and public buildings, including indoor and outdoor use. The platform lift is very versatile, offering 71 standard platform sizes and a rise of up to 15 meters. It can also be accessed from three sides, features an adaptable design and has many colors and door models to chose from. The closed shaft makes users feel safe, as does smooth running of the hydraulic drive. Gulliver is frequently installed in stairwells. It also offers numerous benefits for outdoor use: the drive module does not have to be in the immediate vicinity of the system, but can be installed in the building, significantly reducing operating costs. Gulliver's space-saving installation is ideal for new or existing constructions. In addition, the modular system allows short installation times.